In all, 11 Championships Records and eight All Comers Records were established on the A. O. Shirley Grounds, under overcast conditions. With non OECS member Puerto Rico looking to solidify their No. 16 ranking for next month's Rio Olympic Games and hosts BVI seeking to improve on their 44.05 seconds mark, starter Ashley Kelly-coming off taking down the championships 400m record and also a BVI national mark-got them off to a good start but Puerto Rico's sprinter Beatrice Cruz gained some ground. Cruz's gain was suddenly taken back with veteran sprinter Taheisa Harrigan-Scott, who ran a stellar second leg to hand off to Long Jumper Chantel Malone. Malone, with a slight lead passed off to Karene King ahead of Genoiska Cancel. With the hometown faithful on their feet, anchor leg King stormed home trying to hold off the charging ex Southern California All American Carol Rodriguez, who nipped her at the the line in a Puerto Rican National Record of 43.43 seconds, to break their six-year old mark of 43.46. The BVI finished in 43.45 seconds-their first time under 44.00-and in the process wiped out St. Kitts-Nevis' OECS Record of 43.53. 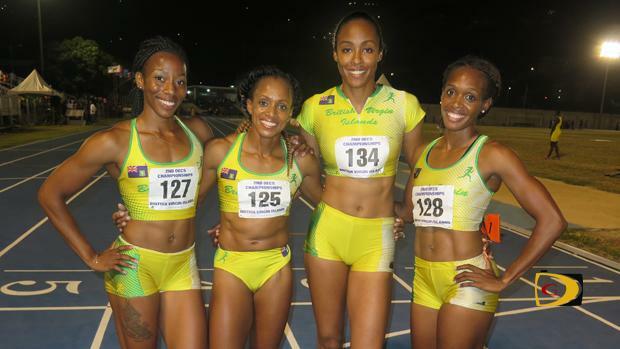 St. Kitts-Nevis-with two members of their 2009 record setting squad in the lineup-placed third in 45.19. Puerto Rico's time erased the three-year old All Comers Record of 43.97 seconds set by Canada in 2013. With three teams in the lineup-OECS Record holders Antigua and Barbuda, St. Kitts-Nevis and non OECS member Barbados all of whom had run 38.65 seconds or faster-the soft eight-year old All Comers Record of 41.10 seconds established by Puerto Rico was going to fall. Barbados in particular, ranked No. 17 among relay teams eyeing a spot in Rio, came to the meet needing to run 38.59 seconds, which would have bumped Cuba from the No. 16 position. St. Kitts-Nevis got out fast, holding a lead through the first three legs before the serious running began. By the time the pecking order was established at the finish, Antigua and Barbuda's Miguel Francis-with the second fastest 200m time in the world this year of 19.88 seconds and coming off winning the 100m in 10.34 seconds-ran past Barbados' Mario Burke to win in 38.91 seconds a Championships Record, wiping out St. Kitts-Nevis' 39.38 time from 2014. Barbados followed in 39.11 and St. Kitts-Nevis got to the line in 39.39. The Championships Records began falling when, the BVI's Harrigan-Scott ran a season's best of 11.25 seconds-just 03 off her 11.22 All Comers Record from 2010-to win the 100m and erased Dominica's Hermine Joseph's 11.83 seconds from 1991, in the earlier version of the championships. Kelly then followed with a Championships Record, after measuring her steps to nip fast starting and defending champion Kineke Alexander of St. Vincent and the Grenadines at the tape, 52.29-52.30. It was a personal best and National Record, erasing the 52.35 established by Malone in 2010. Grenada's Kanika Beckles was third in 53.37. In the men's 400m race, St. Kitts-Nevis' Warren Hazel had a comfortable 46.30 seconds victory over the BVI's Khari Herbert who ran 46.63, and destroyed his countryman Lestrod Roland's meet record 47.67 from 2014. St. Vincent and the Grenadines' Brandon Valentine-Parris, finished third in 46.77. The next meet and All Comers Record to fall on the track came when St. Vincent and the Grenadines' Delhonni Nicols-Samuel lapped everyone except second placer Reon Radix, to win the 5000m in 15 minutes, 08.62 seconds. Grenada's Radix, ran 15:59.09 while countryman Tallan James was third in 16:38.55. Nicols-Samuel's time, erased St. Lucia's Jason Sayers All Comers mark of 15:40.32, from 2002. Marbeq Edgar led a St. Lucian 1-2 finish in the 800m, while erasing Antigua and Barbuda's Dale Jones' 26 year old mark of 1 minute 53.5 seconds covering the two circuits in 1:50.22 as the new Championships Record. Michael James was second in 1:51.30 and St. Kitt-Nevis' Masai Jeffers, third in 1:53.25. Tynelle Gumbs of the BVI, started off the field events record spree, when she added more than 10 meters on to St. Vincent and the Grenadine's 37.32m mark from 2014, for a Championships, All Comers and National Record, with her 47.51m measurement. Twin sister Trevia was second with a throw of 43.93m, while St. Kitts-Nevis' Stavia Lewis also went over the old mark with her 38.74m effort. In the men's equivalent, BVI strongman Eldred Henry claimed the 26-year old meet record of 49.22m established by Dominica's Brian Bynoe, with a third round throw of 53.22m. Henry's mark also wiped out Eric Matthias' 51.51m 2008 All Comers Record. With the Triple Jump being contested for the first time in the history of the championships, St. Lucia's Sandisha Antoine laid down the standard with a fourth round 13.38m leap, after opening with 13.34m, to break Malone's eight-year old All Comers Record of 12.40m. Dominica's Thea LaFond was second after cutting the sand at 12.70m while Kala Penn of the BVI secured third place with her second round leap of 12.39m. St. Kitts-Nevis' Jermaine Francis took down the BVI's Raymond Solomon's 25-year old High Jump Championships Record of 2.10m and Karl Scatliffe's All Comers Record of 2.13m, with his leap of 2.16m. After Day I, St. Kitts held a five points advantage over St. Vincent and the Grenadines, 65-60, in the Men's Division. Grenada is third with 46. The BVI has 33, St. Lucia, 31, Antigua and Barbuda 26, Dominica 18 and Montserrat 8. In the Women's Division, host BVI amassed 69 points followed by Grenada with 42. St. Kitts occupies third place with 29, one ahead of St. Vincent and the Grenadines. Defending champions St. Lucia is in fifth place with 15. Antigua and Barbuda is on 11 points, Anguilla 10 and Dominica 8.